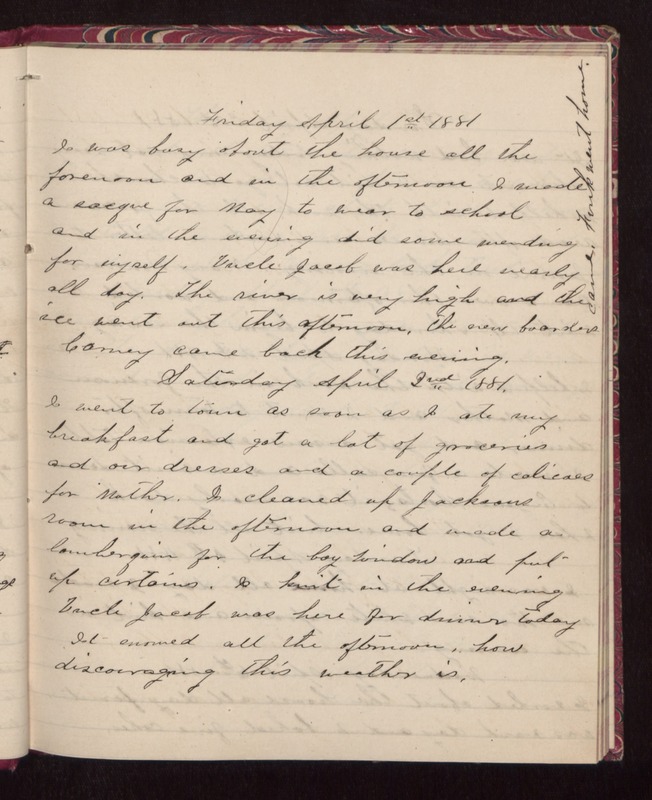 Friday April 1st 1881 I was busy about the house all the forenoon and in the afternoon I made a sacque for May to wear to school and in the evening did some mending for myself. Uncle Jacob was here nearly all day. The river is very high and the ice went out this afternoon. The new boarders came. Frank went home. Carney came back this evening. Saturday April 2nd 1881. I went to town as soon as I ate my breakfast and got a lot of groceries and our dresses and a couple of calicoes for Mother. I cleaned up Jacksons room in the afternoon and made a lamberquin for the bay window and put up curtains. I knit in the evening Uncle Jacob was here for dinner today. It snowed all the afternoon. How discouraging this weather is.